Our world faces many challenges, from climate change and air quality to energy efficiency and security. With Mirai, we are making a start for the better, to ensure that we can enjoy a future that cares about the environment. There are multiple kinds of powertrains and energy sources that show outstanding environmental performance. However, the overall environmental assessment of a vehicle should consider the entire life cycle: from design, through production and driving and, finally, at the recycling phase. In order to measure the overall environmental impact, detailed life cycle assessments were carried out in accordance with ISO 14040/44, and certified by the independent experts of TÜV Rheinland. The next step is to derive recommended courses of action and measures that will lead to ecological optimisation of our products and processes over the entire vehicle life cycle. Toyota strives to develop each model in such a way that it delivers far better environmental properties than its predecessor. Mirai takes this ethic a step further. 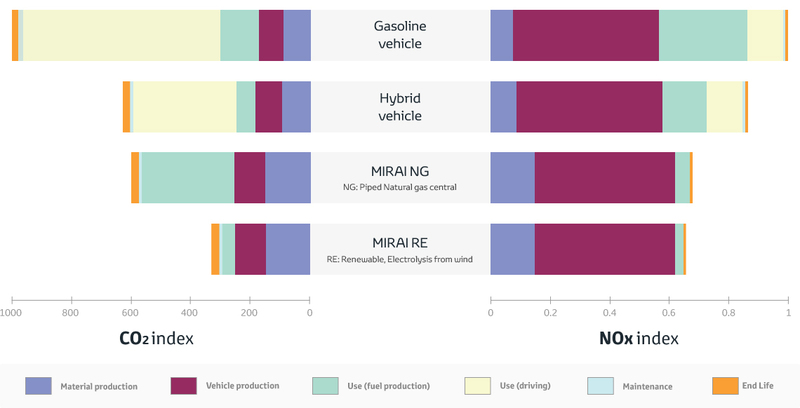 Depending on the way hydrogen is produced, an overall CO2 reduction of 40-70% can be achieved compared with a conventional powered petrol vehicle. And in the future, with more and more hydrogen being produced by renewable energy, the CO2 emissions related to the driving phase will be reduced to zero, generating only water as a by-product. A sustainable hydrogen society Hydrogen can be produced from various primary energies, the method of extraction dependent on the country in question. It can also play a major role in the spread of renewable energy. Solar and wind power are intermittent sources, resulting in unstable generation that requires an adequate storage system. One way to store these intermittent renewable energies is to convert them to hydrogen, a method that’s more appropriate than batteries for large storage thanks to a higher energy density. The society of the future must utilize renewable energy and smartly integrate the electricity grid with the hydrogen grid for effective use. To realise a future of sustainable energy-based societies using hydrogen, we must fully utilise renewable energy while effectively integrating electricity and hydrogen grids as one. A future led by technology Resource efficiency plays an important role in Toyota’s organisation. The recoverability rate of the Mirai exceeds 95%. As the Mirai’s fuel cell stack is using the precious metal platinum, Toyota created the world first stack collection and recycling network. In Europe, Toyota has set itself the challenging target of aiming to collect 100% of these industrial batteries. In 2010, Toyota succeeded in establishing the world's first battery-to-battery recycling operation in Japan. Furthermore, as of 2013, batteries are reused in stationary energy storage applications. Realising that our raw materials are finite, Toyota is continuously progressing towards a resource-efficient economy. Take the first step towards becoming one of the first Mirai trailblazers by filling out our short sign-up form. Long-distance driving with Toyota Mirai - a hydrogen fuel cell car Europe’s network of hydrogen fuelling stations is continually expanding. In practice though, is it really possible to drive a hydrogen fuel cell car from northern Europe to southern Europe? Jacob Krogsgaard, CEO of H2 Logic, put it to the test with his Toyota Mirai. Toyota Mirai Awards We have a proud history of environmental achievements. Being the first to mass-produce the pioneering hybrid vehicles back in 1997, we have gone one step further by launching the Toyota Mirai... Fuel Cell Technology Fuel cell vehicles (FCV’s) are powered by fuel cell stacks, which generate electricity from a reaction between hydrogen and oxygen from the air. Toyota Olympic and Paralympic Partnership | Toyota Europe We’re incredibly proud to announce our partnership with the International Olympic Committee and the International Paralympic Committee until 2024. Toyota at Geneva Motor Show This year at Geneva discover how Toyota is bringing a better future to the roads – and one car is capturing all of the attention: the new Toyota C-HR! Life Cycle Action From design, through to production, driving and recycling, we take into account everything we use and manufacture to see how it impacts the environment and our health, through a 360º approach called Life Cycle Thinking. The Recycling Process As a manufacturer of vehicles, it is hugely important that at the end of our product lives we have considered how to reduce their environmental impact.